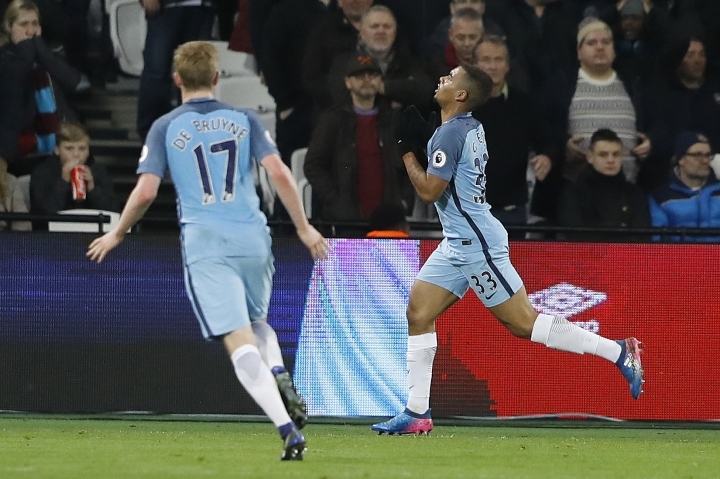 LONDON — Gabriel Jesus marked his full Premier League debut with a goal and an assist as Manchester City's new-generation attacking combination tore through West Ham in a 4-0 Premier League victory on Wednesday. The 19-year-old Brazilian prodigy flaunted his speedy talents against a disjointed West Ham, showing he has quickly adapted to English football by laying on the opener for Kevin De Bruyne and then scoring City's third. "He helps a lot with the high pressing. He's so intense. He's so aggressive," City manager Pep Guardiola said. "He is able to keep going, to fight against guys who are taller than him." Only one area needs some work — his discipline — after waving an imaginary card at the referee and being shown the real thing in yellow. Aside from that lapse, he slipped into a thrilling triumvirate up front with 22-year-old Raheem Sterling and 21-year-old Leroy Sane. Guardiola sees them as the "future of the club," and their teammates were also beaming. "They are very sharp, these guys," De Bruyne said. "They are so quick, it's almost impossible for us to follow them in the midfield. They have great energy." Their challenge now is to turn City into title-challengers again, with Guardiola's side remaining fifth behind Liverpool on goal difference. Securing one of the four Champions League places is the priority. 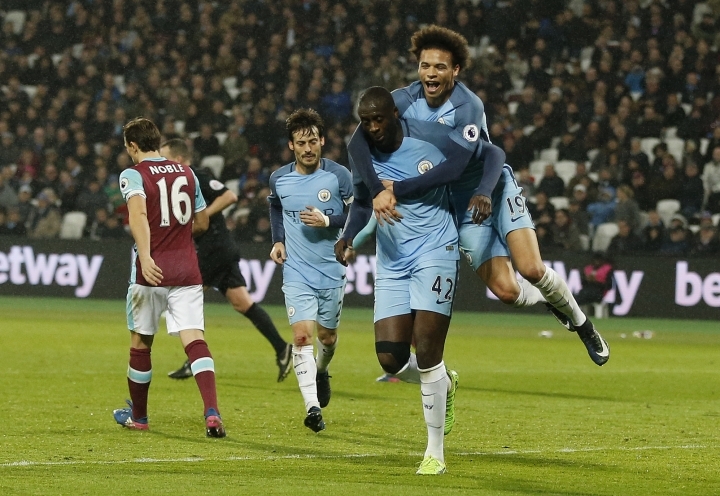 The 31-year-old midfielder David Silva also netted at the Olympic Stadium and the rout was completed by City's oldest outfield player in the second half when 33-year-old Yaya Toure converted a penalty. De Bruyne bridges the generations, with the 25-year-old playmaker pulling the strings from midfield, instigating attacks — just as he did for the opener. 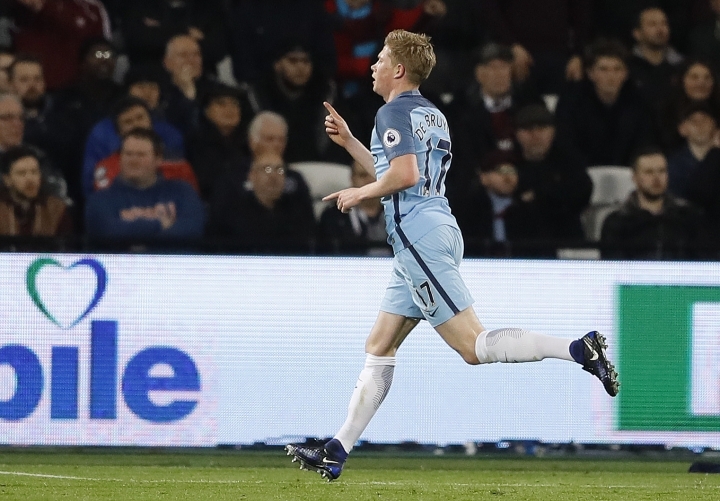 Setting the tone for an inept performance by 11th-place West Ham, Aaron Creswell's poor pass on the halfway line allowed De Bruyne to seize possession and launch a counterattack. The Belgium international carried the ball forward through the center of pitch unchallenged before rolling it out to Gabriel Jesus on the right flank. 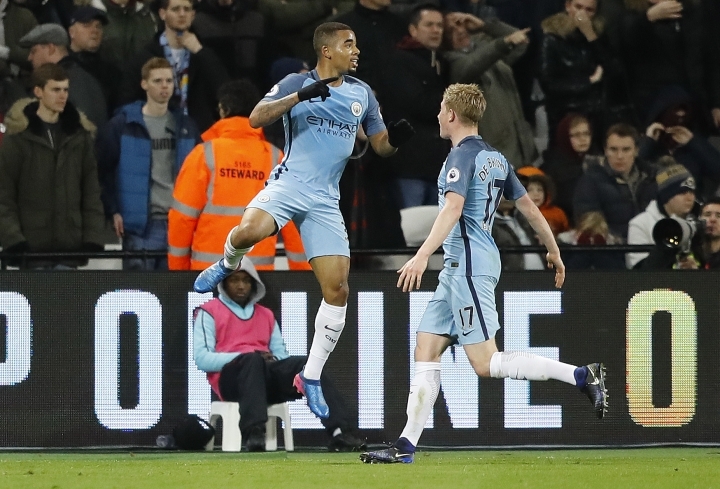 As De Bruyne advanced, Gabriel Jesus squared a pass back to the midfielder who coolly swept a shot into the bottom corner in the 17th minute. It was De Bruyne's 11th goal in 50 Premier League appearances. Four minutes later, he was the creator of City's second with a through-ball to Sane that allowed the German to dribble in from the left before laying off the cutback for Silva's tap-in. 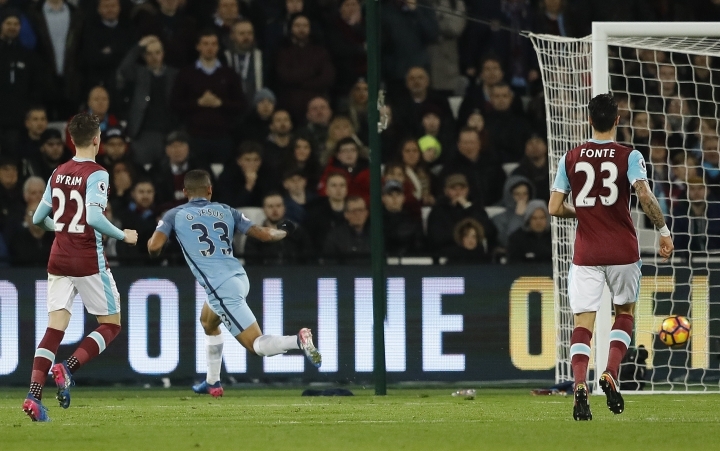 Gabriel Jesus' shining moment came six minutes before halftime, completing a move that started with more sloppiness from West Ham. Pedro Obiang conceded possession and Sane exploited the carelessness before threading the ball through to Sterling. The England winger picked out Gabriel Jesus to slot home. Few goals will be easier for the 2016 Olympic gold medalist in the Premier League, against a team still reeling from the January transfer window departure of midfielder Dimitri Payet. On a night when City provided a glimpse of the promising future, Toure and Silva were the only two players in the starting lineup who also started the game that clinched the team's first Premier League title five years ago. Roberto Mancini, City's 2012 title-winning manager, was in the east London stands on Wednesday to watch this fresh generation in action under Guardiola's command. So too was Sergio Aguero, whose stoppage-time goal against Queens Park Rangers clinched that title, with the 28-year-old striker forced to watch from the bench until replacing Sterling in the second half. Such was City's dominance, there was little attention on the unexpected decision by Guardiola to drop goalkeeper Claudio Bravo in favor of Willy Caballero, who faced only one shot on target.